The last time scientists visited Ile aux Cochons in 1982, an island that is part of an archipelago in the southern Indian Ocean, the king penguin population was booming. Over 500,000 breeding pairs (around 2 million penguins total) huddled together there, making the island the largest king penguin colony in the world. But new research shows their numbers have been on a stiff decline since then—by as much as 88 percent. And scientists don’t really know why. To get the current penguin count on Ile aux Cochons, researchers employed a combination of high-resolution satellite imaging and photos taken from helicopters. Estimates of the total number of penguins were made based on the square footage they occupied, because they huddle so close together. The researchers found that the penguins declined from 502,400 breeding pairs in February 1982 to just 59,200 in April 2017, as they noted in their study published last week in the journal Antarctic Science. Over 2 million king penguins lived on Ile aux Cochons when this photo was taken in 1982. The researchers offered up a few possible scenarios in their paper for what could be at hand here. For one, feral cats and mice were found on the island in the 1970s, and were almost certainly introduced by humans traveling to the island. As the cats multiplied, they may have posed a predatory threat to penguin eggs and chicks, and probably still do. Parasites like ticks and and diseases like avian cholera may also be plaguing the penguins, either killing them off or making it hard for babies to survive. Boersma said climate change and overfishing may also be the culprit. King penguins’ favorite food is myctophid fishes, also known as lanternfishes, which they hunt at depths of up to 300 feet. But myctophids have been overfished, and warming waters could be nudging their habitats elsewhere. Identifying precisely what’s going on matters not just for king penguins, which are listed as “least concern” on the IUCN Red List of Threatened Species, but also for other, more vulnerable penguins. 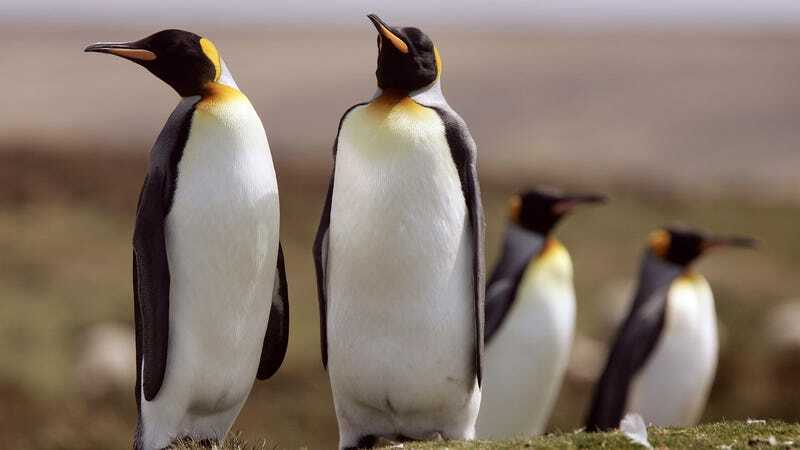 Understanding threats to penguins in remote locations, Boersma said, is critical—penguin declines are often a sign that something funky is going on with the environment there.